When I was a Work/Study in 2011, one of the classes I chose for my work/trade was Dr. T’s Soap Making class. 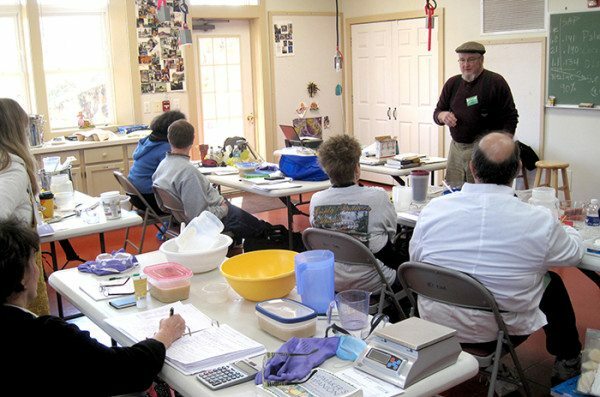 For a total beginner, the class was an amazing introduction to the chemistry and art behind creating your own customized cold process soap batches. Dr. T (aka Tim Tyndall) teaches Soap Making regularly at the Folk School. I’m a huge fan of Tim and his soap… Enjoy our interview. Checking the temperature of the milk and lye. CP: How did you become involved with the Folk School? 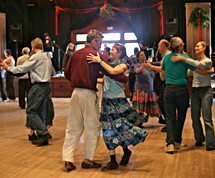 Dr. T: About 10-12 years ago, Charlotte Latin School bused their 8th grade “graduates to be” to the Folk School for a celebration where students could choose 2-4 classes over a 2-day period. A parent who had been a customer and attended one of my demonstrations here at the Soap Shed, suggested to someone at the Folk School that they contact me to do Soap Making segments for the Latin students. The Folk School contacted me and I came down to initiate a soap class experiment. Things went well; the students were pleased; I had fun; and I was asked to propose what regular soap classes might look like for the curriculum. 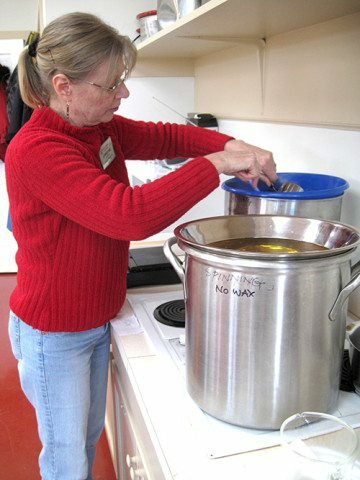 Soap Making classes have been a part of the “curriculum” since then. I guess I have kinda been the “lead dog,” so to speak. CP: Why do you like teaching at the Folk School? First and foremost, I have always loved teaching. I have been an educator and administrator at all levels from private high school, community college, and university, focusing in science. I live in Spruce Pine, NC where we have the Penland School of Crafts and taught in Rome, Georgia, home of the Berry School. These schools, like JCCFS and Berea, focus on the goal of helping mountain or rural people marshall their skills and talents from generations of practice towards economic gain and enrichment for themselves, their families, and their communities. I expected this would be the “Spirit of the Folk School” which I so richly enjoyed my first visit. To be a part of that AND to share some of my self taught skills as a contemporary soap maker is a most satisfying endeavor. I have learned much “Lore” and have a cadre of stories about the history of soap making as a foundation craft in an earlier time and an artisan craft today. I teach because it is FUN and I love seeing my students accomplish things they came to the school thinking they could not do or understand. They surprise themselves and give a thrill at the same time. That’s why I like teaching at the Folk School. CP: Why do students call you “Dr. T”? Since I do have a doctorate, in academic settings, some of my students felt like they had to address me “formally” which I have always discouraged. I was blessed to have the opportunity for higher education but I don’t need to be set apart as better or something, especially in an egalitarian setting like Folk School. A student once asked: Do you care if we affectionately call you “Dr. T” since we learn so much and have so much fun in your classes? That has pretty much stuck with me for those who have been clued in. I accept it with delight when I hear it but do nothing to promote my academic background other than history. It makes things too, too serious. Fun and learning is what it is all about. CP: What made you want to be a soap maker? Natural question! The answer is I never wanted to be a soap maker nor had I even given it a thought. SO, the real question is: What IS the story? It came as a choice of options when Karen (my wife) and I had to re-invent ourselves mid-1990s in rural Appalachia when all of our industrial clients left the country and went “offshore.” Until then we had a thriving management and manufacturing consultancy specializing in the textile and furniture industries. When they all left, we had no work, were in a very rural setting and could not get any traction for work in any other industry; regardless of our extensive education and experience. We had to rethink EVERYTHING we knew and settled on looking at the unique opportunities that might have historical and economic possibilities right where we lived. There were and still are hundreds of artisans and crafters in our area who worked with their hands and hearts to make a living keeping arts and crafts alive as a matter or principle and historical significance. We determined that soap making was becoming a “new” old craft in New England but had not yet made its presence known in the “South.” My background in science, especially biology and chemistry, equipped me to learn both the old and the new ways for soap making. We launched the Soap Shed in June, 1998 by joining the then thriving craft show circuit active all over the Mid-South all the way to Florida. Almost by “default” I became a professional soap maker. CP: How are things at the Soap Shed? Great! We are in our 17th year of business. We began in June, 1998. 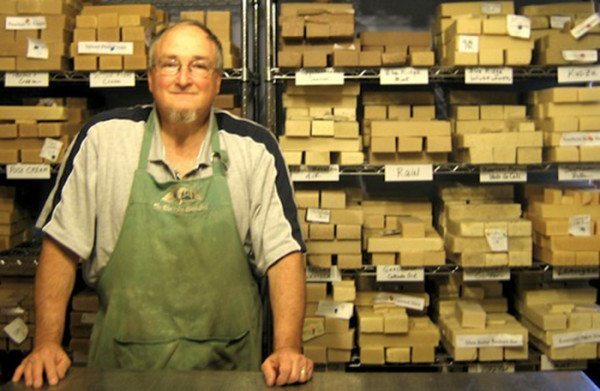 We today make the largest variety of hand crafted soaps in the USA. Our offering includes over 150 soaps, with 5 unique base formulas and around 8 non-fragranced soaps. There are around 20 specialty soaps designed especially for some frequent skin condition. We use vegetable oils in several blends: palm, coconut, olive, hemp, or castor plus rich butters like shea and cocoa for 98% of our soap products. Tim Tyndall tests different types of milk with lye. CP: How is your homemade soap different from soaps you would find in big box stores? In addition, glycerin is naturally produced which softens and conditions the skin. Some extra water is produced. Soap is a good cleanser, conditioner, and “disinfectant” when properly made. Specialty formulations can work wonders on problem skin. In contrast, “commercial soaps” are manufactured chemical detergents and NOT soaps at all. They are very harsh and “rip” all of the natural oils from your skin when used. Ever wonder why you reach for the “lotion” just after using commercial products, particularly when your skin feels dry and scratchy? All natural oils your body has produced since your last bath or shower to keep your skin healthy have been ripped away leaving nothing! In short, most commercial “soaps” are made from burned up, recycled fast food restaurant fats that have been reprocessed chemically into detergents with added foaming agents, and maybe a cheap useless “moisturizer.” These are perfumed to make them smell good and made appealing to the consumer through 100s of millions of dollars of advertising. Very few commercial products of any kind “housed” on the “soap aisle” are worth even looking at much less buying. CP: It’s neat that you make specific soap blends for Fiber Artists. How did you recognize this need? We think it is neat too. Thanks for saying that. However, marketing is a key issue in all business and being a soap making business does not change that. The genius behind this is Karen since she is the business and marketing guru. Since we make soaps targeted for different skin conditions, many years ago we defined common craft or work conditions that would be harsh and make good skin care difficult. 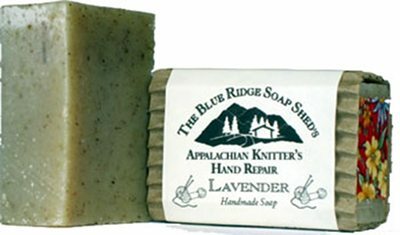 Living where so many people are into about every craft there is plus working outside and with animals, we were flooded with questions about whether we could make a soap that would help with “whatever.” Karen and I both researched fats, oils, butters and essential oils that might be helpful for certain skin situations. As a result we began producing products that could address a host of similar conditions whether it was for a knitter, quilter, goat herder, or ironsmith. Labeling product for special groups of crafters and workers simply helped direct them towards the proper combination to best address their needs. CP: Can you talk about the difference between the soaps that were crafted in this region during the time of early American pioneers and homesteaders versus the artisan handmade soap of today? Some of this was answered earlier, but here is the difference: Prior to the 1950s most soaps were made from animal fats. Even those made commercially, which then were not commercial, chemical garbage. Our ancestors made their soap exclusively from animal fats: lard (pig) or tallow from sheep, goats, or cows. Our “ancestors” were not chemists and only followed the directions handed down through the generations. Some soap was really pretty good, some rather harsh, some a bit soft and gooy, some almost like syrup. Whatever was made from the fats in the fall (mostly when the animals were slaughtered for food) was what was available for that year. On large farms and in various regions, there could be a second round of fats available in early spring while it was still cold yet before the growing season started. Artisan soaps today are almost always made from some combination of vegetable oils (see above earlier) plus commercially produced lye which is uniform and reliable as to the result. Various fragrances including natural, botanical essential oils or artificial fragrance oils are used to gives pleasant smells to soaps. A host of rich vegetable butters can enhance skin conditioning and care. 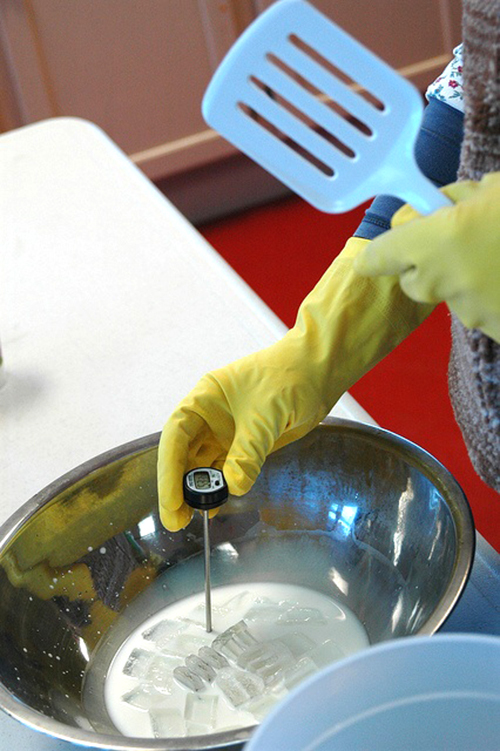 Goat milk added to the soap batter increases lather creaminess and density as well as skin conditioning and has been a favorite for many years. In recent years various natural micas and colored micas plus chemical colors designed for soap oils have been used to give remarkable designs to soap loaves and bars. Different and specialized techniques can be used to create designs and variants that are truly amazing. Molds can be made of any size and shape for soap bars. CP: Have you noticed a boom in manly customers interested in artisanal soap lately? How do you think the resurgence of dandyism or blogs like “The Art of Manliness” and have affected men’s body care? We have always had a disproportionate group of men shop with us here at the shop AND on the craft circuit when we were doing shows all over the southeast from 1998-2001. Soap is often considered something that women take care of. NOT true here at the “Shed” necessarily. After 2001 we focused our operation in Little Switzerland where we had a retail shop and then here on our property and quit “touring”. There has been a resurgence of men’s shaving soap interest over the last decade with several men’s groups having a presence on the internet. Diehards who have revived using a “straight razor” are always looking for unique shaving soaps which meet their stringent qualifications. This is why I began experimenting with special combinations for this audience. I have a following but have not done much with it yet. They are willing to pay big money for exceptionally good product. I have been our cook for 25 years and cooking is my creative outlet, too. When there is something on the schedule in cooking when I can come over, I do that. 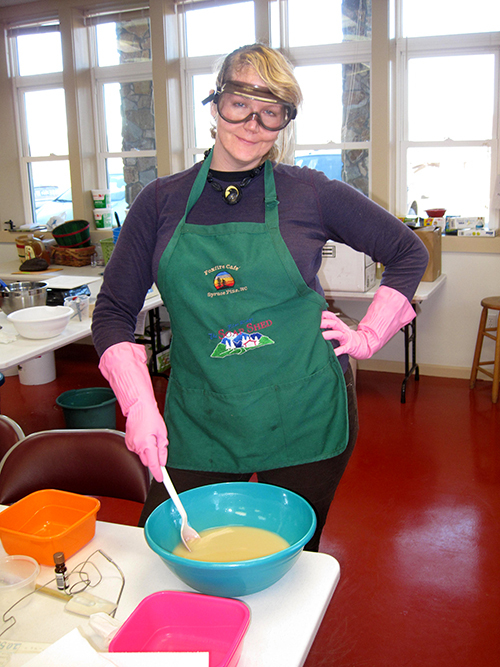 I am not sure which of 2-3 cooking classes I have taken I liked the most. One exploring vegetarian, flat bread, and middle eastern cuisine was probably the one I learned the most from since it dealt with cooking techniques and spicing about which I had little knowledge. On another note, however, about three years ago I decided I wanted to learn another Appalachian Craft. I chose Appalachian Broom Making. 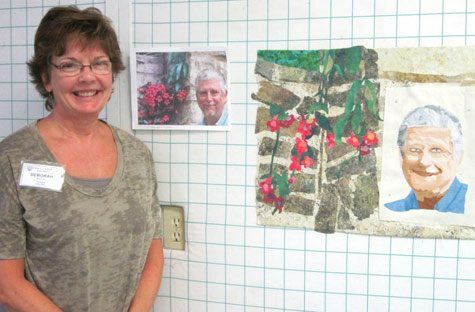 I have taken two week-long and one week-end class with Marlow Gates from Leicester, NC, a regular at the Folk School. I had met him years ago at one of his demonstrations at the Blue Ridge Parkway Folk Art Center. We later became craft buddies and then I took his classes over a two year period. He is a MASTER and such a nice guy, a true gentleman. I now make a few brooms here and hope to sell a few in the shop this summer. I am no longer a novice, but definitely not a Master. 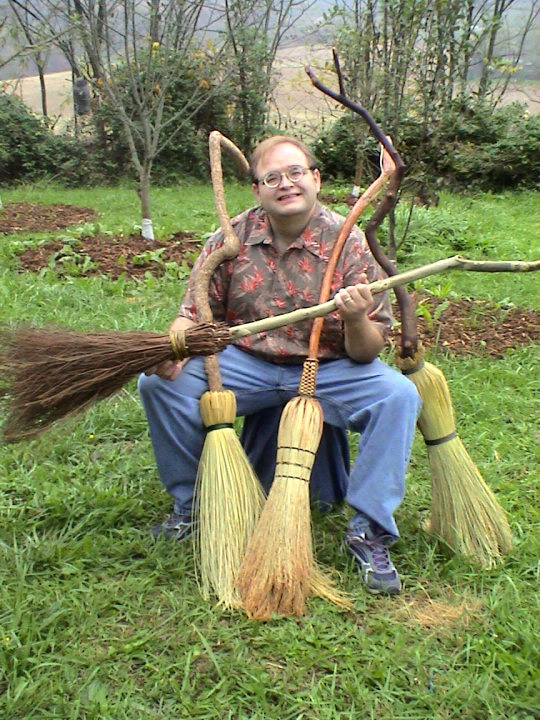 I love doing them and get nice compliments on my display of brooms from my classes at the Folk School. 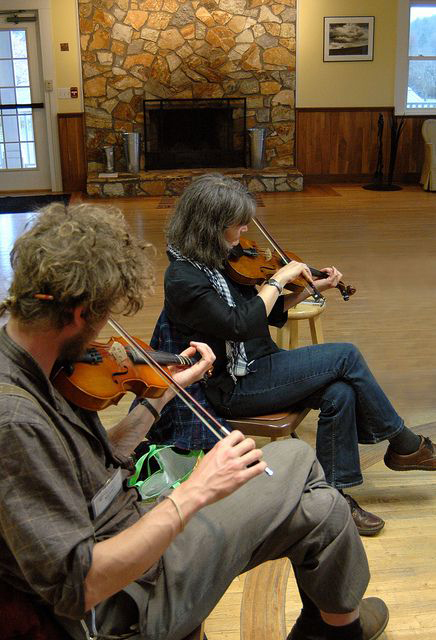 CP: What is your favorite Folk School memory? After more than a decade that is HARD to answer. I always relish when my students discover things about themselves and open themselves up to new possibilities. However, I do remember several older students, in their 70s, kinda where I am now, who came wanting to check out “soap making” but not expecting they could do it or understand it. They were “scared to death of working with “lye” which is often the case, but even more petrified about having to do math in soap calculations. Horror of horrors!!! BUT>>>BUT…..Although I am good at what I do, and may know as much about soap making in all aspects, especially technical, as anyone, AND have the capacity to translate the complexities in understandable and accessible ways, soap making instruction is only a vehicle for allowing people to become more internally aligned and free to express themselves and expand their human spirit. To me, that is a large part of what the Folk School enables in people: a chance to be freer than they have been in a long time and for some, ever (At least until the next time they come but this time with some expectation). To be surrounded by a supportive cast interested only in a person’s release of the free spirit of creativity, is so satisfying and such a necessary contribution to the expansion of humanity’s potential. To even have a glimpse of that process is so beautiful not to mention being an actor in the event itself! Learn to make cold-process soap safely and with confidence. 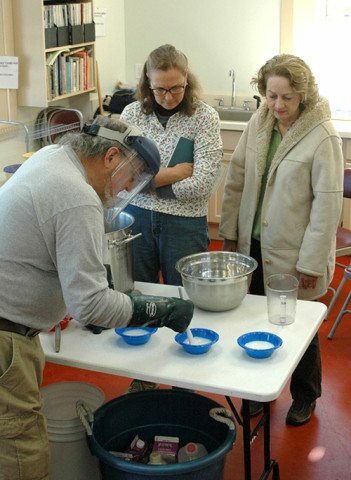 This intensive week will cover ingredients; safety procedures; formulation theory; scenting with essential/fragrance oils and herbs; additives such as milks, butters, clays, colorants, and/or abrasives; molding and cutting options; curing procedures and timing; and regulation, where appropriate. Create many soaps of your choosing; most students leave with 8-12 pounds in a wonderful variety. Register today. 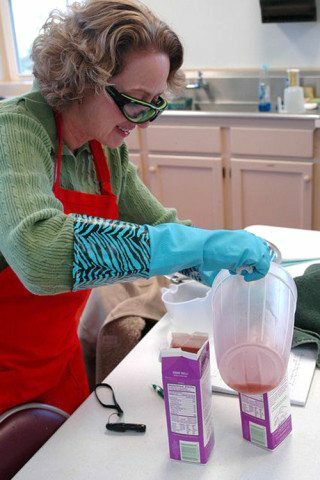 See all upcoming Soap Making Classes at the Folk School. 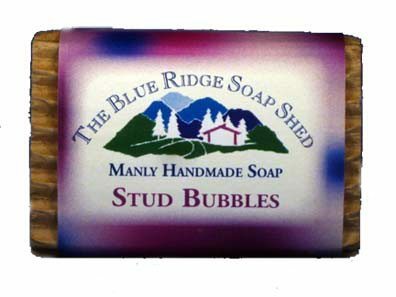 Tim and his wife opened the Blue Ridge Soap Shed in 1998. When cottage soapmaking was in its infancy, “Dr. T” developed an intimate knowledge of the science of the craft, drawing on his 30 years of teaching biology and chemistry. With over a million bars under his belt, he does provide “Soap for Every Body.” Popular books tell the basics, but experience teaches the subtleties that only come through observation, study, and practice. Tim has taught at the Folk School since 2003 and equips students to independently develop their own unique formulations with safety and confidence. What’s New at the Folk School?